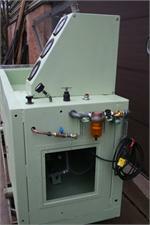 This test stand is designed to pressure test hose using high pressure water in the safety of a closed chamber. 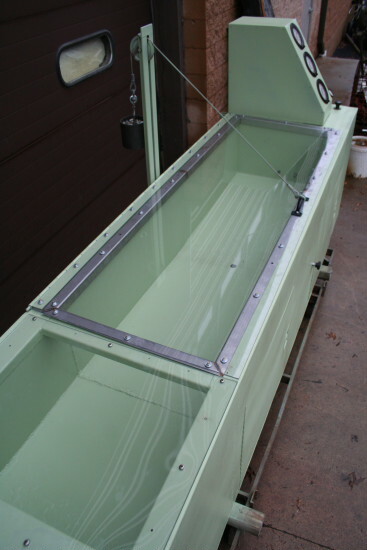 The test hose is placed in the tank, the lid is closed, the hose is filled with water then connected to the pressure port on the tank wall. Regulated compressed air is used to drive a 60:1 Sprague pump which creates the high pressure water that is piped to the test hose in the tank. 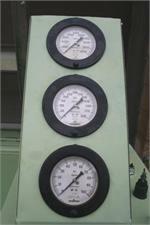 This test stand is very versatile because of the pressure range covered by the three gauges. This stand can accurately test low pressure items like turbo system components and intercoolers by using the 100 psi gauge or it can test air, fuel and some hydraulics lines using the higher pressure gauges. 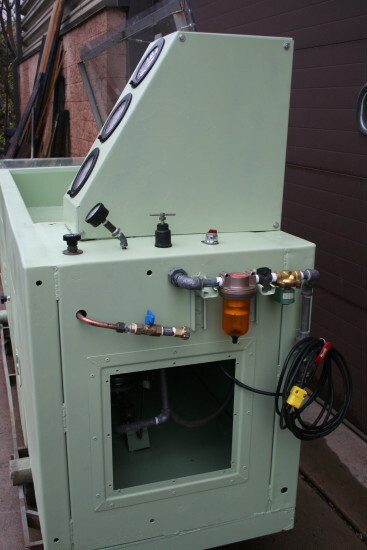 This unit was tested using an aircraft fuel hose which ruptured at about 5,800 psi. Call 800.624.7760 with any questions. 60:1 ratio, 6,000 psi max output. 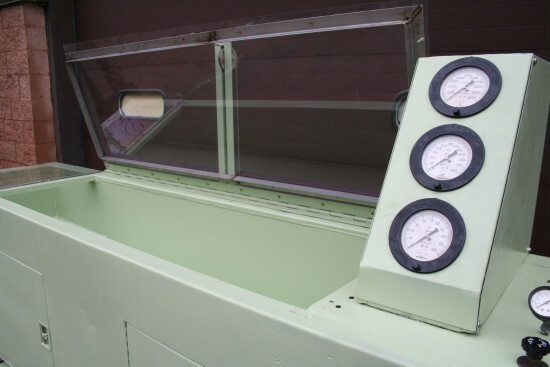 A regulator is inline on the output side of the pump. Three pressure gauges in parallel, 100 psi, 600 psi and 10,000 psi. 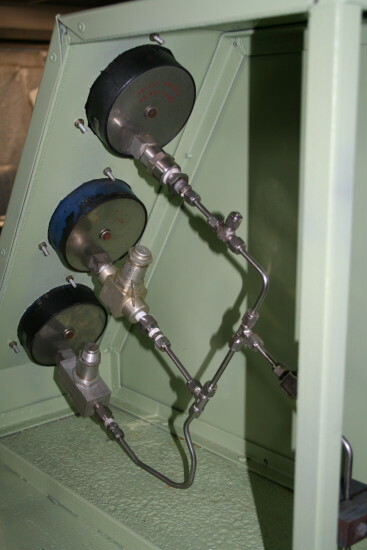 The 100 & 600 psi gauges are protected by adjustable snubbers which bypass the gauge when the snubber limit is reached allowing pressure stream to continue to next higher gauge. 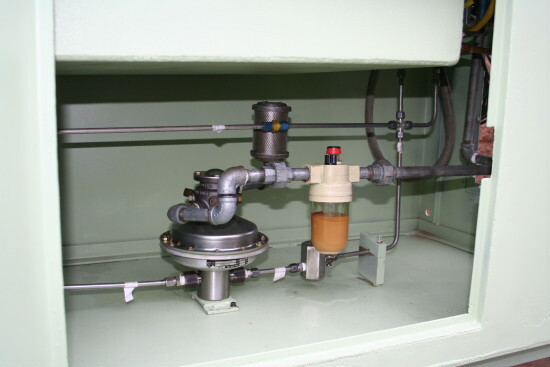 A pressure release valve is located on the cabinet front to release pressure in the system. An electric switch turns on power to a solenoid controlled air valve which supplies air to the pump via a regulator which, when pressure is increased, starts the pump. 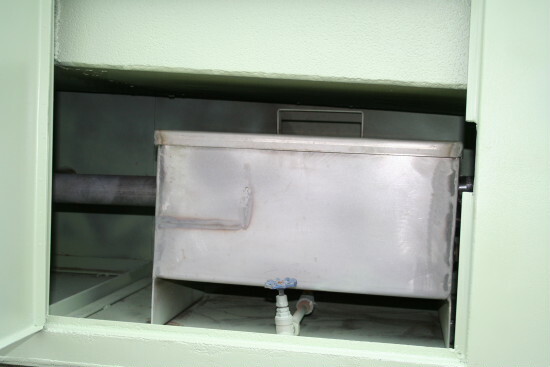 A cutoff switch is activated when the lid is raised, closing the air feed solenoid. A water connection port delivers water to a fitting in the tank which is the hose fill port. Another port serves as the pressure connection port. A third port is for future use. 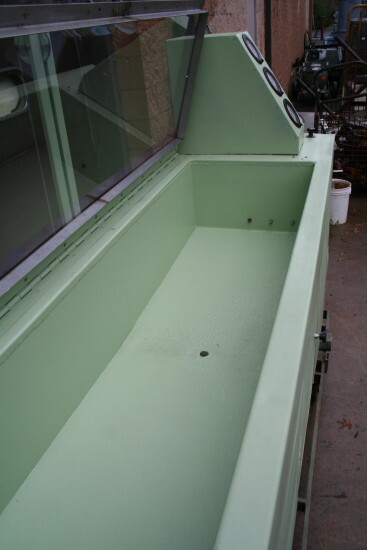 A stainless steel tank mounted under the test chamber accumulates water from the chamber and releases the water via an overfill pipe to the rear of the cabinet. 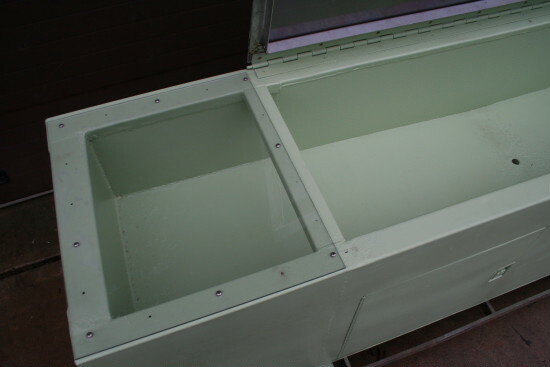 This system was completely refurbished by stripping the cabinet of all components, sand blasting and painting with epoxy. However there are areas of the cabinet surface where pitting is apparent, but the pitted areas will in no way affect the machines operation. Unit was tested up to 5,800 psi with a hose in the chamber and all components operated correctly. 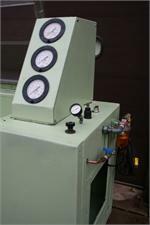 Also called: Hose pressure test rig. 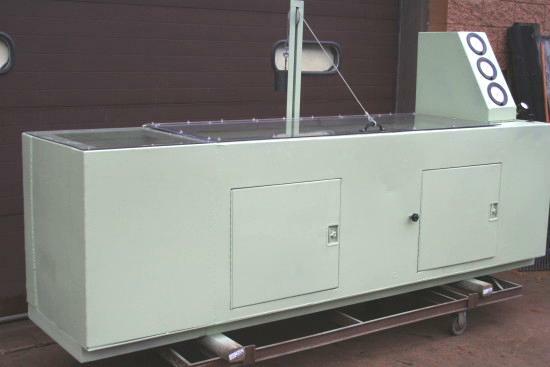 Hose proof tester. Burst Tester. 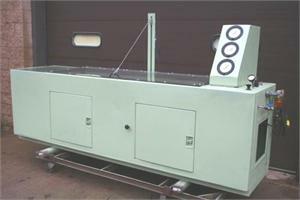 Hose testing stand.